Levodopa (INN) or L-DOPA (3,4-dihydroxy-L-phenylalanine) is an intermediate in dopamine biosynthesis. In clinical use, levodopa is administered in the management of Parkinson's disease. It is also used as a component in marine adhesives used by pelagic life. Levodopa has a chemical formula of C9H11NO4 and a molecular weight of 197.19 g/mol. 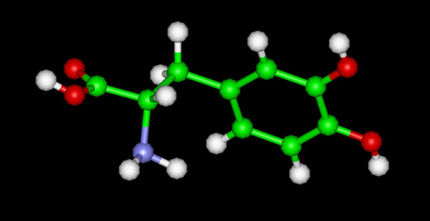 Levodopa is used as a prodrug to increase dopamine levels for the treatment of Parkinson's disease, since it is able to cross the blood-brain barrier, whereas dopamine itself cannot. Once levodopa has entered the central nervous system (CNS), it is metabolized to dopamine by aromatic L-amino acid decarboxylase. Pyridoxal phosphate (vitamin B6) is a required cofactor for this decarboxylation, and may be administered along with levodopa, usually as pyridoxine. However, conversion to dopamine also occurs in the peripheral tissues, i.e. outside the brain. This causes adverse effects and decreases the available dopamine to the CNS, so it is standard practice to co-administer a peripheral DOPA decarboxylase inhibitorâ€”carbidopa or benserazideâ€”and often a catechol-O-methyl transferase (COMT) inhibitor. In contrast, co-administration of pyridoxine without a decarboxylase inhibitor accelerates the extracerebral decarboxylation to such an extent that it cancels out the effects of levodopa administration, a circumstance which historically caused great confusion. In work that earned him a Nobel Prize in 2000, Swedish scientist Arvid Carlsson first showed in the 1950s that administering levodopa to animals with Parkinsonian symptoms would cause a reduction of the symptoms. The neurologist Oliver Sacks describes this treatment in human patients with encephalitis lethargica in his book Awakenings, upon which the movie Awakenings is based. Herbal supplements containing standardized dosages of L-DOPA are available without a prescription. These supplements have recently increased in both availability and popularity in the United States and on the Internet. The most common plant source of L-DOPA marketed in this manner is a tropical legume, Mucuna pruriens, also known as "Velvet Bean" and by a number of other common names. Two of the most popular brands of Mucuna pruriens are "DopaBean," marketed by Solaray, and "Mucuna," marketed by Physician Formulas, Inc. These preparations claim to contain standardized dosages of L-DOPA in enteric-coated capsules. The dosage claimed is usually about 50 mg per capsule, and the recommended dose is two capsules per day. A third product, "L-Dopa," marketed by Unique Nutrition, claims a higher effective dose of 250 mg. American Nutrition also carries a Mucuna pruriens standardized to 40% L-DOPA under its NutraceuticsRx label. Some of the claims made for the use of these supplements may have validity, whereas many do not. Among the most common claims are that the supplements will increase libido and aid in body-building (presumably by increasing human growth hormone in both cases). The long-term consequences of the use of these supplements by healthy individuals remains to be seen. Both levodopa and its precursor amino acid L-tyrosine are precursors to the biological pigment melanin. The enzyme tyrosinase catalyzes the oxidation of L-dopa to the reactive intermediate dopaquinone, which reacts further, eventually leading to melanin oligomers. Hyland K, Clayton PT (1992). "Aromatic L-amino acid decarboxylase deficiency: diagnostic methodology". Clin Chem. 38 (12): 2405-10. PMID 1281049. Waite, J. Herbert, et al. (2005). "Mussel Adhesion: Finding the Tricks Worth Mimicking". J Adhesion 81: 1-21. Messersmith, Phillip B., et al. (2006). "Rapid Gel Formation and Adhesion in Photocurable and Biodegradable Block Copolymers with High DOPA Content". Macromolecules 39: 1740-1748.